The temporary Brickell Stage was designed and erected by a group from the university, and hosted a range of free outdoor performances that included music, comedy and poetry. It comprises 1,001 orange-painted rods, fixed vertically to a square base in the same colour. The poles decrease incrementally from three sides to the centre, leaving a triangular area at the front to be used as a stage. "This design creates a forced perspective that focuses the attention of the spectators on the performers and heightens the visual experience for all," said a statement from the team. 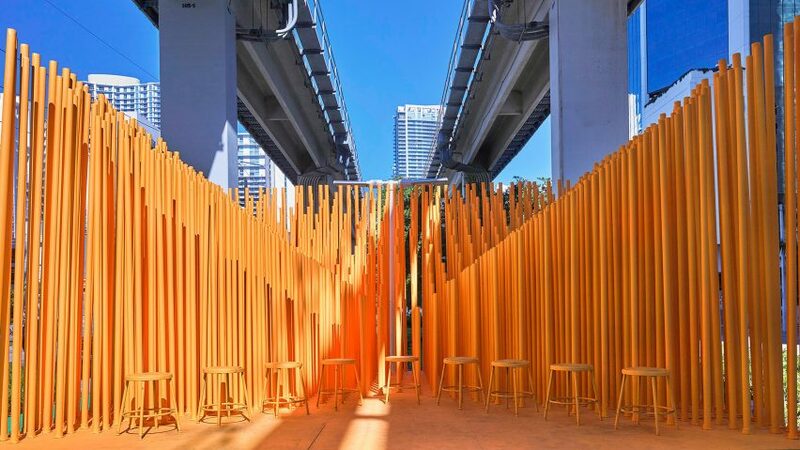 "The open-air structure creates a sense of place with an elevated stage and flexible seating to host a variety of free interactive performances," the team said. The project was a winner of The Miami Foundation's Public Space Challenge, which promotes the creation and enhancement of parks and potential gathering spaces in the city.